This is Memorial Day weekend in the U.S., and we thought you might enjoy some inspiring red, white and blue quilts. The Quilted in Honor exhibit, which benefits Operation Homefront, features over 50 quilts by celebrity designers. Read on for details and links to designer patterns... some of them are free! Depicting the raising of the American flag at Iwo Jima in 1945, this original art quilt was designed by Rob Appell, who says: "When I was offered the opportunity to use my art to help provide assistance to those who have served our country in the armed forces, I decided to dive in headfirst... I was true to my soul in the creating of the quilt." For information about Rob's quilts, see Rob Appell Designs. "This quilt is dedicated to all the men and women who have served our country. Because of their service, we live in a free country." As of this writing, you can download a free pattern for Dawn's Early Light. We love the gently waving quilting lines as shown below. This is such a clever bargello design for a flag. Kari Nichols says: "[This quilt is] dedicated to my father, Louis Gowen, a Bronze Star recipient... May the courage and sacrifice of all veterans and service members never be forgotten." As of this writing you can download a free pattern for Honor by Kari Nichols. Ricky Tims says: "When first asked to design a quilt for the Quilted in Honor project, I wanted to honor the brave men and women who serve our country and the world by creating a quilt that symbolized our flag and what it stands for." The pattern for Stars and Stripes Forever is available for $5.00 at C&T Publishing. All proceeds from the sale of this pattern benefit Quilted In Honor, a fund-raising initiative for Operation Homefront. The blocks are paper pieced, and the project is suitable for most advanced beginner quilters. Jackie Robinson says: "John Philip Sousa knew how to write the music that makes patriotism ring in our souls. This quilt is dedicated to the memory of our fallen soldiers. The protection of the Stars and Stripes was in their hearts." As of this writing, you can download a free pattern for Stars & Stripes. Sarah Vedeler says: "This quilt was made in honor of all who have served, all who are currently serving and all who will serve in the future." 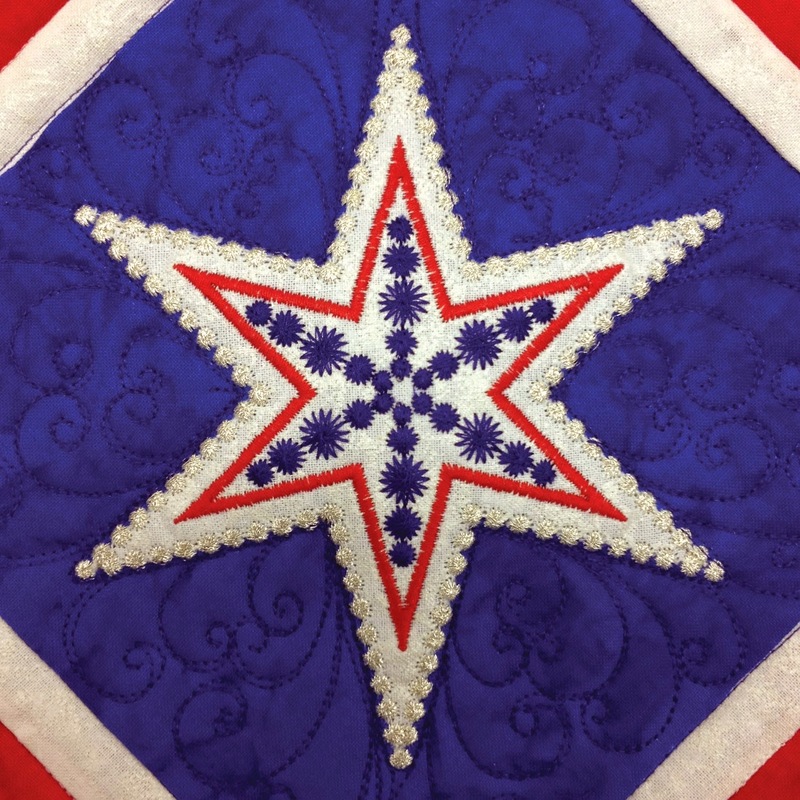 As of this writing, the pattern for Patriotic Stars II by Sarah Vedeler can be purchased for $5.00 at the Pattern Spot; all proceeds benefit Quilted In Honor. The stars are nestled in between log cabin blocks. Log cabin paper piecing templates for the 7.5" blocks are available for free download at Sarah Vedeler Designs. In the above photo you can see Sarah's decorative machine embroidery designs on the stars. Sarah Vedeler has created an extensive embroidery design collection to work with her GO! Stars dies at Accuquilt. An example is shown below. Embroidered star by Sarah Vedeler for Accuquilt GO! Image credits: Photos of quilts were taken by Quilt Inspiration at the 2014 AQS Quilt Week-Phoenix and the 2013 Houston International Quilt Festival. You can see more free Quilted in Honor patterns at Island Batik. The exhibit may be coming to a quilt show near you... check out the exhibit schedule here.